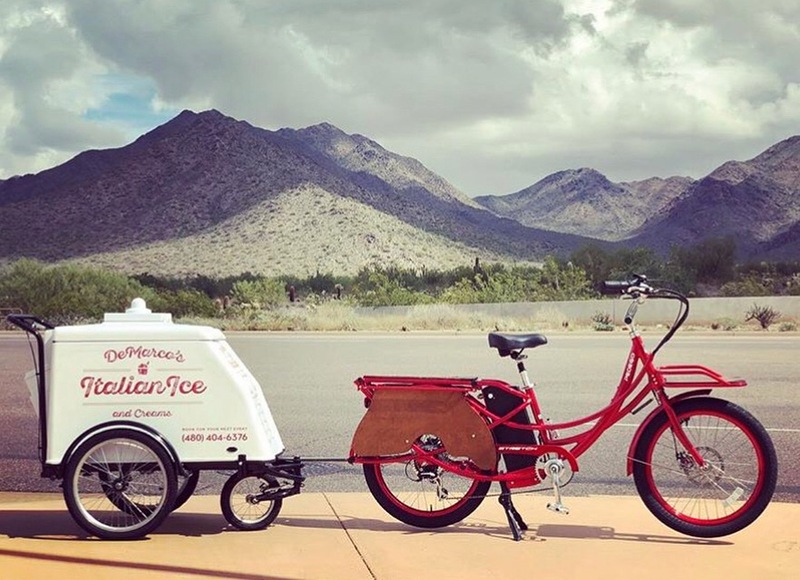 We are looking for additional locations to provide our growing following with a consistent supply of Scottsdale’s Best Italian Ice & Custards. We have created two additional ways to enjoy DeMarco’s Homemade Italian Ice & Creams. Launching a custom old fashioned pushcart that is attached to a retro style electric bicycle. This option is perfect for smaller footprint venues it can be served both indoors or out. This enables us to serve our homemade desserts in single serving sizes complete with a self contained secret spoon. In addition our retail segment has taken root. 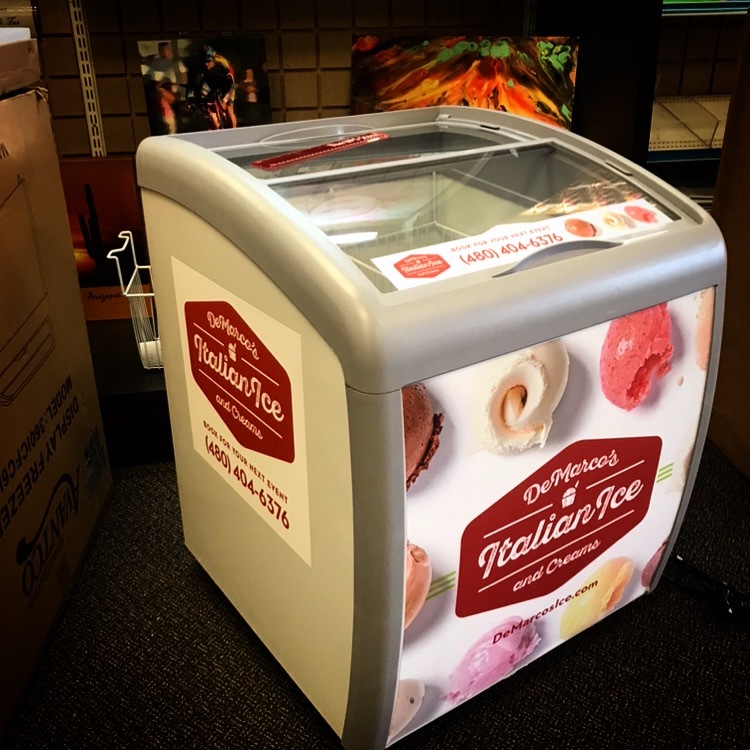 Our first custom freezer is located at Crisp Premium Pizza in Old Town Scottsdale (7111 E 5th Ave). Our second location is a non-traditional setting, Autohaus of North Scottsdale (9550 N 90th St) keeping its customers and employees cool in the desert.We are currently looking for additional locations to provide our growing following with a consistent supply of Scottsdale’s Best Italian Ices and Custards. Best Strawberry Italian Ice I've had since being in Italy. I would give it 10 stars! Can't wait to go again!!! Absolutely Fantastic, no matter what flavor you get! Creamsicle and Cannoli Cream are wonderful. Both Creamy and refreshing, without being overpowering. Hope to see them again soon! Yummy, yummy, yummy...!!! I love the banana cream ice. I can taste the real bananas in every bite. I had some last night and forced myself to put it away. This morning, I wanted more so I will have some with brunch. I might just make it brunch. The quality of this dessert is excellent. No need to take my word for it. Try it and you will see. DeMarco's was at Kiss Me Kate Boutique Sunday and OMG, It was fabulous! From the Italian ices to the incredible creamy ice cream and root beer floats, it was such a treat! Thank You to the DeMarco family for such a great business. Excellent owner. I work for the post office and I know a thing or two about food trucks. Let me tell you something, this Italian Ice is amazing, making it from scratch even more amazing. That's what you get when you try this truck. So if you see the truck parked anywhere I suggest to pull over and try something. The ices are to die for, something that reminds me of summertime on the Wildwood, NJ boardwalk as a kid. It's such a simple pleasure and Joe has totally knocked it out of the park. You most definitely ain't gonna fugeddaboutit!!! OMG, they are the best!!!!! 38 years ago I had a cup of Italian Ice not knowing had food coloring, sent me to ER for overnight stay!!! since then I couldn't even look at Italian Ice until by friends recommendation I had DeMarco"s Italian Ice ,all natural and local which I am a big fan of.I had my daughter tried 2 different flavors,she loved it as well, We are big fans now.My plan for dessert for future event and parties of any kind would be DeMarco's Italian ice.You have to try it, order the biggest size they have,the small ones wouldn't be enough to kill your craving.We enjoyed it a lot, we hope you do as well,It is heavenly delicious. This place is fantastic. I sampled the lemon, mango, and strawberry ices and the Oreo custard. Holy cow! Everything was amazing. I'm glad I had my kids with me so I could get everything and help them eat it all. The owner is also very nice. I will need to stop anytime I see this truck out! I had the chance to order from DeMarco's and all I have to say is YUMMY!! Seriously, it was so good I couldn't stop thinking about for days and days after. I ordered the Cannoli Cream topped with Chocolate Custard. Even better is the fact that it's a family that owns and runs this fantastic business, and they are really nice! Growing up in Queens, New York in a large Italian community (Howard Beach) provided me the love of heritage from which I create DeMarco’s Italian Ice & Creams. I was exposed to some of the finest Italian Ice establishments in New York, each with their unique specialities. Spumoni Gardens in Brooklyn had the best Spumoni (not to mention the best Sicilian pizza.) The Lemon Ice King of Corona had the best Lemon Ice, Lyndhurst Bakery in New Jersey had the best Banana Cream, and Ralph’s of Staten Island had many unique Cream Ice flavors to choose from. My desire is to use my passion and knowledge to create a true Scottsdale original, DeMarco’s Italian Ice & Creams. Moving to the Valley over 20 years ago, my search for my childhood dessert has led me to create a dessert everyone can enjoy. 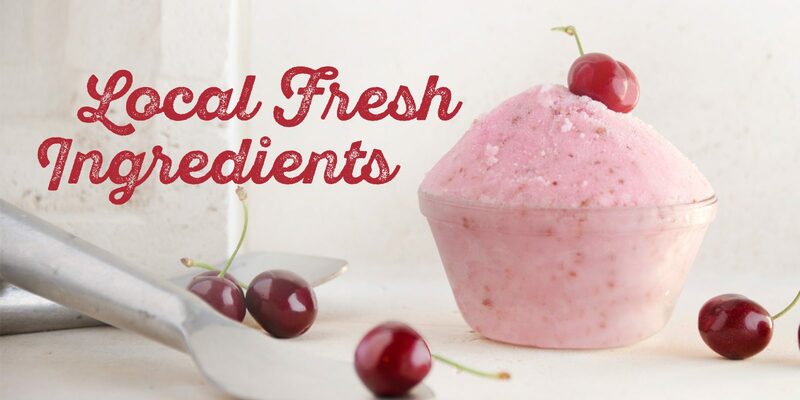 To get the true authentic taste of New York Italian Ice, we make our classics ices with the finest ingredients available – right down to our Madagascar vanilla extract we make in-house. Each batch of our Pistachio Cream Ice is made with several pounds of whole pistachios in order to obtain a rich and nutty flavor that rivals anything you’ve ever tasted. Spumoni, with its combination of chocolate, cannoli cream and pistachio, is the perfect trifecta of flavorings. Our Cream Ice contains 5% cream yet tastes like a premium homemade Ice Cream. We also feature Homemade Custard that finds its roots with the local Dairy Farmers right here in Arizona. DeMarco’s Italian Ice & Creams are made using one simple philosophy: start with the finest ingredients and finish with a dessert that’ll keep you coming back for more. 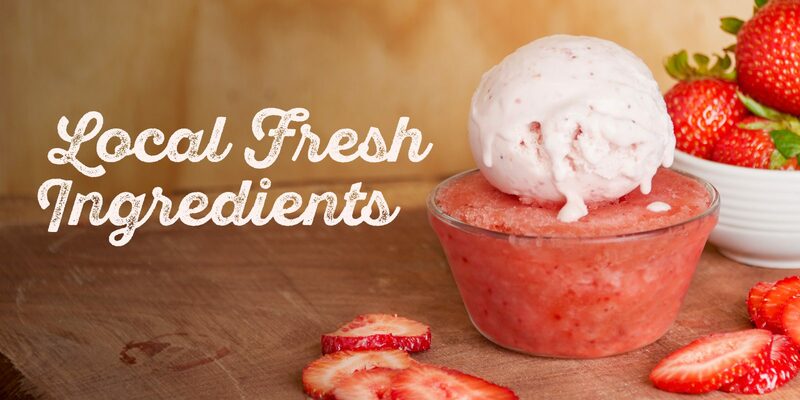 All our recipes, including our extracts and flavorings, are made from scratch with no artificial anything! Come and taste the difference. DeMarco’s provides onsite party and special event catering ranging from family get-togethers to rehearsal dinners, weddings and formal affairs. 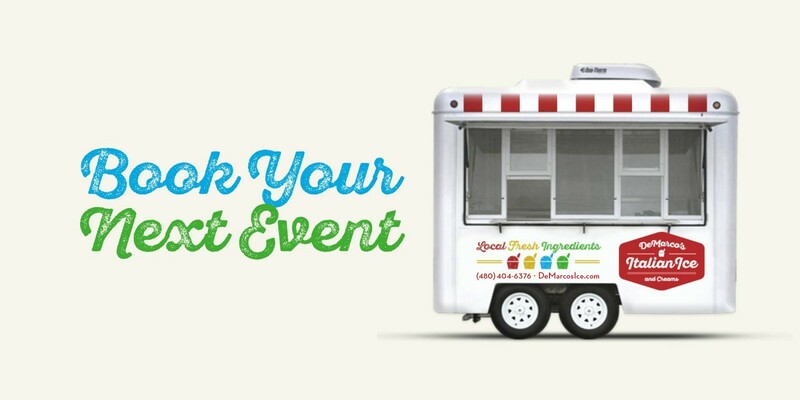 If you are interested in getting a quote from DeMarco’s on-site catering at your event, please fill out the form below. We also offer the option to purchase Homemade Italian Ice & Custard’s anytime. We will provide you with one 3 gallon tub of Spumoni (Chocolate, Cannoli Cream or Pistachio) plus two other 1 1/2 gallon tubs of your choice of flavors. Also included are cups and spoons for 100 people. If you are close to the Scottsdale area I can deliver it to you a few days before your party. The cost is $100 +$8.00 tax. You can come to one of my events to sample many of the choices.